Rabbits are one of the cutest animals out there. You’ll always know that one person who’ll have one or more of them as pets. You want to know how you can tell how cute rabbits are? In this game, even rabbits are saving rabbits. That cuteness level is going to be hard to one up. 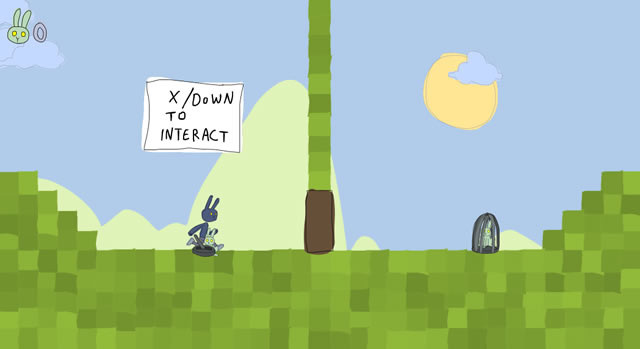 Sofra is an action platform game that lets you play as a cute little rabbit that can walk on his two hind legs like a regular human. Your goal is to save all the other rabbits that can’t protect themselves from hawks and all other hazards. You’ll be playing the game with the use of your keyboard. The arrow keys will make you move to the respective direction you press. The up button will make you jump. Pressing the down button will make you interact with whatever is directly at your feet (if it’s a cage, it gets opened, if it’s a rabbit, you pick it up). You can, and will have to, pick up multiple rabbits at a time by picking up another one while already holding one or more. You can press the X key to drop all rabbits on your hands at the same time, and press either down or X to pick them all up at once. As you go through the game, multiple threats will start to present themselves along with some puzzles you’ll have to solve. For example, there will be a time when you’re carrying multiple rabbits and will have to make a jump. But carrying a lot of rabbits will make your jump a bit lower and less controlled, so you’ll have to drop a few rabbits before jumping, drop whatever remains from the ones you’re carrying on the other side, get back to pick up the ones you left, then going over and carrying all of them again. More like this will be presented later on with extra challenges, so make sure to stay on your toes. Sofra is a very great game with a level of cuteness that’ll keep you hooked. The challenge this game suddenly presents is also very good. If you want to play a game that’ll keep you thinking as well as one that’ll test your reflexes, then Sofra is the game for you. This entry was posted in Games, Physics, Platform, Puzzle and tagged Rabbits. Bookmark the permalink.